Note: these steps were documented for Google Sheets, but a similar process should work for Excel. 1. Open Quicken and select all "All Transactions". Description or Payee/Security - use the field where you put the transaction description. In this example, we'll use the "Payee/Security" column. 3. Put a check next to any additional columns you want in your Tiller spreadsheet. With Tiller you can customize your Transactions register by adding extra custom columns. Read more about Tiller’s automated and supported columns here. 4. Above the transactions list, confirm these transaction detail settings:Select "Transactions" to export all transactions instead of "Spending" or "Income" only. Select "All Dates" or set the dates you want to import. Tiller can automatically pull up to three months worth of transaction data from most institutions. We recommend that you choose an end date from Quicken that corresponds to just before Tiller was able to bring in your data, to prevent duplicate Transactions from being added into your sheet. Create a Tiller spreadsheet to verify how much data Tiller can pull. Select "All Accounts" or just the accounts you want to import. To make the cleanup steps easier later we recommend you use the same account names in your Tiller Console that you already used in Quicken. This help article explains how you can rename accounts on the Tiller Console. Don’t include any accounts that you don’t plan to include in your Tiller spreadsheets. Select "Any Status" or pick the status you want to import. 5. Now we’re ready to export the data. From the File menu, select "File", "Export", "Register Transactions to CSV File..."
6. 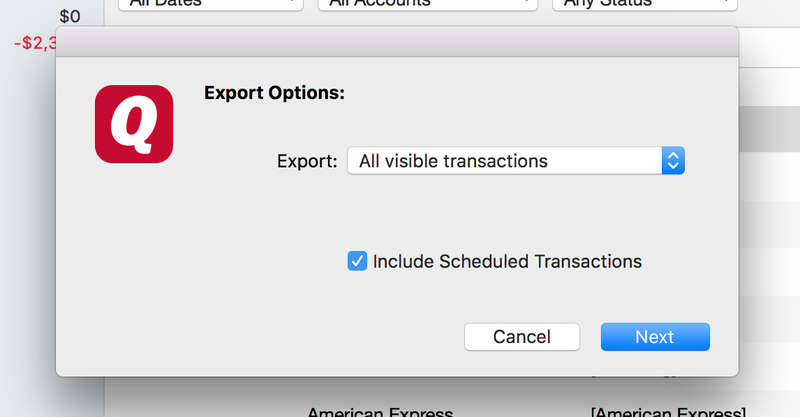 In the Export Options popup, select Export: "All visible transactions". Remove the checkmark next to "Include Scheduled Transactions" checkbox since future transactions will automatically be imported by Tiller. 7. Select "Next" and save the file on your computer. 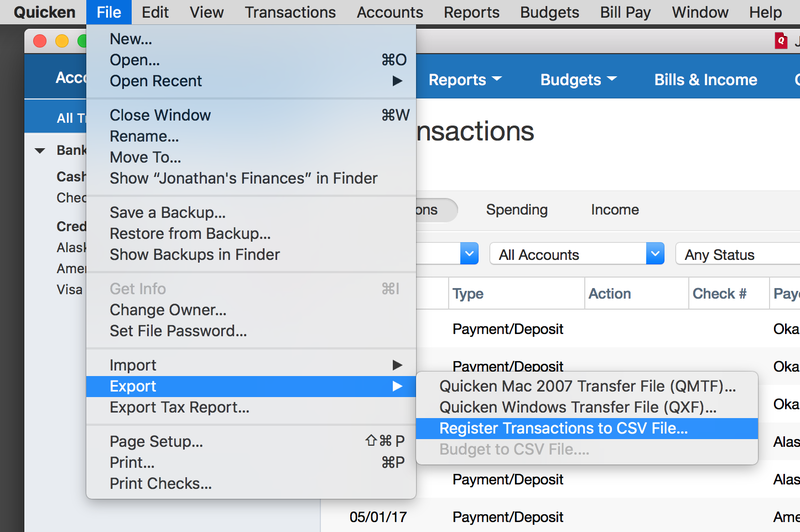 You now have a CSV (comma separated values) file of your Quicken transactions. Now we’re ready to move on to preparing the data for use in your Tiller automated financial spreadsheets. 1. Log in to your Google drive at https://drive.google.com/drive/my-drive and drag and drop your exported Quicken CSV file to this page. The file will be uploaded to Google Drive. 2. Double-click on the file in Google Drive to open it. 3. 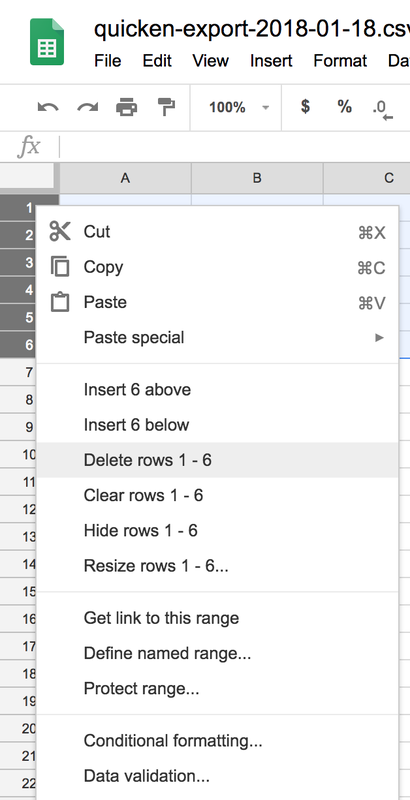 Click the “Open with Google Sheets” to open your Quicken CSV as a Google Sheet. 4. Delete columns A and B. Right click the column letter and choose “Delete column.” Note: There shouldn’t be any scheduled transactions included in this list, and the “split” data can be moved to a “note” or separate column if it’s important. 6. Scroll to the bottom of the Transactions list and clear the inflows and outflows data. There are likely two values at the bottom of the amounts column that correspond to inflows and outflows, and no other transaction data, which you can simply clear. Select the cells with the inflows and outflows data and press the delete key to clear them. 7. Log in to your Tiller Console. If you’re brand new to Tiller review our getting started steps and pay close attention to how you name your accounts (step 4) to have less data cleanup in later steps. Don't make changes to your Tiller Transactions sheet. Only make changes in your Quicken CSV Google Sheet. Match the order of the columns in your Quicken data CSV to the Tiller Transactions sheet column order. To move a column, click on the column’s letter at the top. The cursor changes to a hand icon. Click, hold, and drag the column to the new position. If your Quicken data has columns that are not in your Tiller Transactions sheet, move them to the far right of all the Tiller columns or delete them if you don't need the data in your Tiller spreadsheet. If there are columns in your Tiller Transactions sheet that are not in Quicken, create empty columns in your Quicken CSV export sheet for them. Right-click on a column letter at the top, then choose “Insert 1 left” or “Insert 1 right” to insert a blank column. Note: if you want to preserve your Quicken categories for use in a later step, rename the "Categories" column in your Quicken CSV to "Quicken Categories" and move it to the far right of the other columns. If you do this, be sure to create an empty column called "Category" that matches the location of the Category column in your Tiller spreadsheet. 9. Since Quicken doesn't always add the cents to the amount column, select the Amount column by clicking the column letter. Open the Format menu from the top of your Google Sheet and choose Number → Currency. The Quicken export contains multiple lines for Split transactions and both sides of any Transfer transactions, you don't need to make any adjustments for those types of transactions. Now you’re ready to use the data in Tiller. The next step is moving this correctly formatted data into your Tiller Transactions sheet. 1. Grab all your exported Quicken data by selecting all the rows starting with Row 2. Click the row number for row 2, press and hold the shift key then scroll down to the last transaction and right click the row number and choose copy. Don't include Row 1 which contains Column names. They don't need to be moved over. 2. Navigate back to your Tiller Transactions sheet and scroll to the bottom of the list. 3. Right click the first empty row in column A at the bottom of your Tiller Transactions sheet then choose Paste Special > Paste Values only. 1. You may find the alignment is off in some of the columns for the Quicken data. You can use the toolbar at the top of the Google Sheet to correct the alignment for any of your data. 2. Fill in your Categories. If you’ve set up your Categories in Tiller on the Categories sheet to match the same ones used in Quicken you may be able to copy/paste your Quicken Categories data directly into the Category column for these transactions. If not, you may need to assign your categories according to the way you’ve set them up on the Categories sheet. Use our AutoCat Google Sheets Add-on to help with category automation. TIP: Sort your Transactions sheet by the Quicken Categories column to make bulk updates to the Category column. Learn how to sort your transaction here and how to quickly categorize transactions here. 3. Clean up the rest of your data. Depending on whether you’re using consistent account names between the Quicken data and the data that Tiller is automatically adding for you, you may need to clean up the Account column to make the Quicken data match the Tiller data. If you need to rename your accounts from the Tiller Console, you’ll need to manually update the account name data Tiller has already brought in. Use the Quick Fill Square to quickly update a group of transactions. 4. Sort your data. Finally, you’ll probably want to make sure all your data is in chronological order. Select any cell in the Date column A. Then from the "Data" Menu item, select "Sort sheet by column A, Z -> A.